What types of patterns do you see in each season? Over 5 years? 10 years? What questions can you and your students develop? 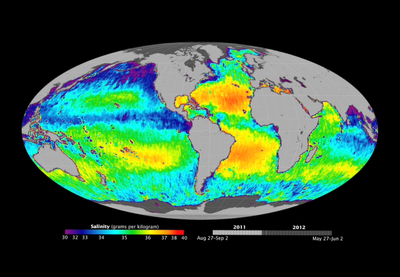 Great Middle School/High School Project:​​ If you compare global data sets from Earth, can you find any correlations between weather processes in the (atmosphere/hydrosphere) and living things (biosphere). Does cloud cover affect land temperature? Is there a relationship between temperature and vegetation? Snow cover? Water vapor? Precipitation? 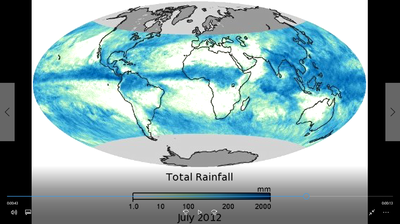 What patterns do you notice about rainfall on Earth in August 2011 and July 2012? How does the amount of rainfall differ in different parts of the world? Is there more in some regions of the Earth compared to others? Are the patterns the same from one year to another? 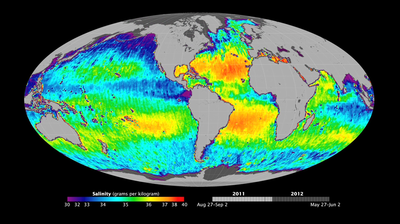 On the right side these satellite data show the concentration or amount of salinity in the seas around the Earth in July 2011 and 2012. How does the amount of salinity differ in different parts of the world? Is it higher or lower in some regions of the Earth compared to others? Are the patterns the same from one year to another? Now compare the left and right sides? 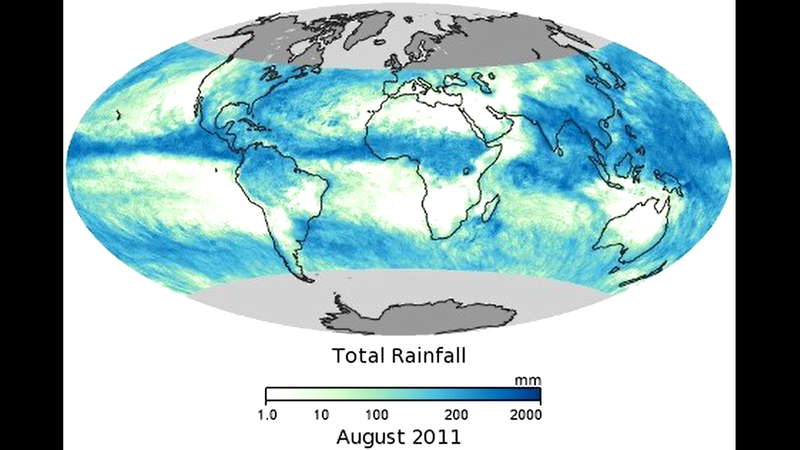 Do you see any correlations or possible relationships between rainfall and salinity on Earth? Do you see any patterns between areas where there is more/less rainfall and areas where they might be more/less salinity? How do you think the patterns might vary at different times/seasons of the year? Do you think the amount of rainfall is the same every year? What do you predict and what are your reasons? Could there be other factors on Earth linked with salinity and rainfall? For some background resources about connections between weather, climate, and living things, take a look at NASA's connections spheres on Earth.